Everyone loves having natural light flowing through a home. Many homes are actually designed to maximize sunlight's ability to energize the home. However, as much as we all want light, we also crave privacy. That's where Hy-Lite windows come into play. "Many homes these days are designed with a master bedroom and bath on the first floor," says Laura Sikes with Hy-Lite, a U.S. Block Windows Company. 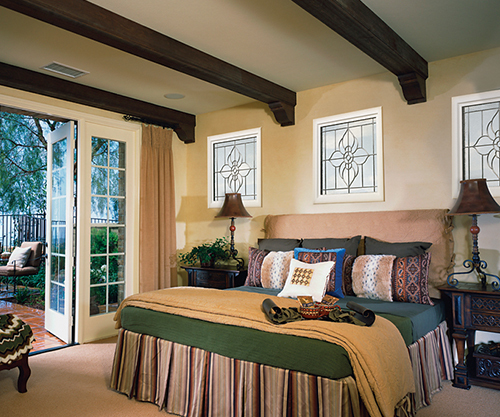 "That easy access of a first floor master suite can mean a loss of privacy for homeowners using clear glass windows. While the windows could be covered up with blinds or curtains, that defeats the purpose of adding light into the home." Sikes recommends privacy windows to encourage light flowing into the home while keeping nosy neighbors on the outside, not looking in. "There are a wide variety of decorative glass and acrylic block window options that add both style and privacy to a room," says Sikes. "Designing a master bedroom with privacy casement or slider windows makes it easy for homeowners to allow fresh air into the room whenever they desire. But, when closed, these windows allow light into the room while protecting the privacy of the homeowners." In addition to being a solution for master bedrooms and baths on the first floor, privacy windows can also be used in kitchens, hallways, dining and living room spaces along with foyers and laundry rooms. "These beautiful windows serve as both 'art for the wall' and as a solution to privacy issues," says Sikes. "They're an elegant addition to the home that also serves a very strong purpose for homeowners."